Inglewood, California, September 15, 2011 - Minus K Technology, a leading manufacturer of vibration isolation products has partnered with Kinetic Systems, Inc in designing a new, versatile, ultra-low-natural-frequency optical table isolation system. The MK52 negative-stiffness optical table achieves 0.5 Hz or lower vertical and horizontal natural frequencies without limiting its ability to support static loads. When adjusted to a 0.5 Hz natural frequency, the MK52 achieves 93% isolation efficiency at 2 Hz, 99% at 5 Hz, and 99.7% at 10 Hz. 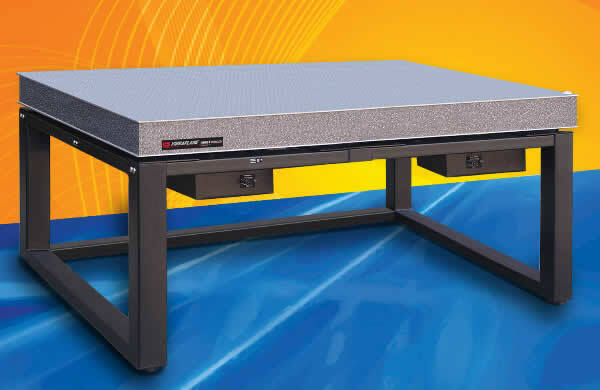 The MK52 Optical Vibration Isolation Table can be configured for a wide variety of locations and applications - wherever external vibrations can adversely affect the operation of sensitive equipment. Ultra-low natural frequencies, high internal structural frequencies, and excellent vertical and horizontal isolation efficiencies make the system well-suited to applications such as analytical balances, cell injection, confocal microscopes, patch clamping, optical microscopes, wafer probing, sensor calibration, and laser applications in fields such as semiconductor processing, telecommunications, aerospace engineering, and medical research. The MK52 is also ideal for applications requiring high resolution, such as Raman spectroscopy, atomic force microscopy (AFM), AFM-Raman integration, and micro-hardness testing. The MK52 is available in table sizes up to 4' x 8' with gross load capacities up to 2000 pounds (909Kg) (larger optical table sizes will be considered). Tables are constructed with a 3/16" thick ferromagnetic stainless steel top skin, 3/16" thick carbon steel bottom skin, and plated-steel precision honeycomb core.